OMAHA - The University of Nebraska at Omaha (UNO) is one of just 27 institutions from across the country to receive a grant from the National Science Foundation (NSF) to enhance the United States' STEM education efforts. 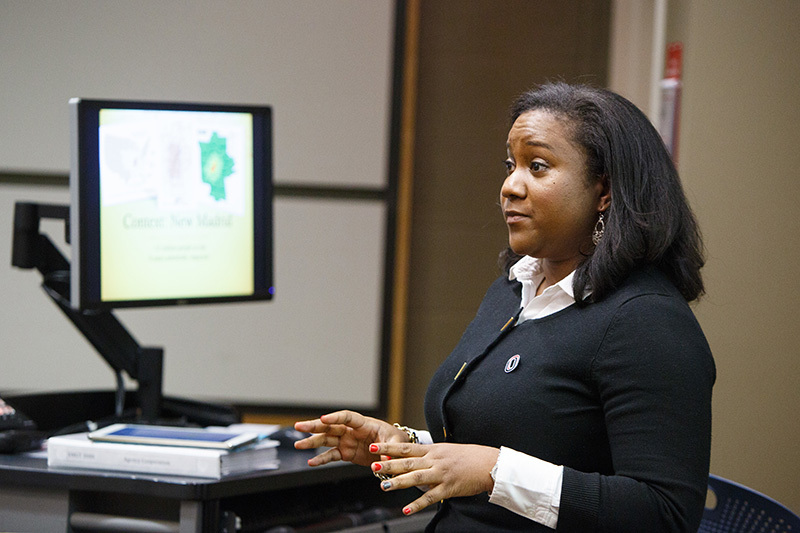 A team of scholars led by Assistant Professor DeeDee Bennett, Ph.D., from UNO's emergency services program, has received $300,000 for a two-year project that seeks to increase the recruitment, retention and matriculation of racial and ethnic minorities in STEM Ph.D. programs contributing to hazards and disaster research. The Scholars from Under-Represented Groups in Engineering (SURGE) and the Social Sciences: Minority SURGE Capacity in Disasters launch pilot will provide the empirical research to identify ways to increase the underrepresentation of minorities in STEM disciplines interested in hazards mitigation and disaster research. Bennett is joined by Hans Louis-Charles, assistant professor in UNO's emergency services program; Terri Norton, Ph.D., associate professor of construction engineering at the University of Nebraska-Lincoln; Lori Peek, Ph.D., professor of sociology and director of the Natural Hazards Center at the University of Colorado-Boulder; and Nnenia Campbell, Ph.D., a research associate at the Natural Hazards Center at the University of Colorado-Boulder. "Increasing the involvement of qualified minorities will help solve the broader vulnerability concerns in these communities and help advance the body of knowledge through the diversity of thought and creative problem solving in scholarship and practice," Bennett said. "Utilizing workshops and a multifaceted mentorship program, SURGE creates a new model that addresses the diversity concerns in both STEM and disaster fields, and make American communities more resilient following natural disasters." The SURGE pilot will serve as a nation-wide programmatic resource for any minority students who are currently pursuing STEM-related fields with and interest in emergency management. The goal is provide students with everything from academic and research support to workshops and partnerships with emergency response agencies across the state and across the nation. Bennett said the importance of her proposal has been evident in the impact of natural disasters like Hurricane Harvey on Texas and Hurricane Irma on Florida and Puerto Rico because low-income and racial and ethnic minority populations often suffer disproportionately during a disaster. "We want to make sure that these students are staying in the programs that they are currently enrolled in at institutions across the country," Bennett said. "There are a wide range of communities that are each affected differently by disasters and these students understand those needs. They are vital to helping educate the next generation of emergency management professionals and disaster scholars." Grant funding comes from the NSF INCLUDES (Inclusion across the Nation of Communities of Learners of Underrepresented Discoverers in Engineering and Science) program, which is designed to create paths to STEM for underrepresented populations, expanding the nation’s leadership and talent pools. NSF INCLUDES is among NSF’s “10 Big Ideas for Future NSF Investments” research agendas that identify areas for future investment at the frontiers of science and engineering. A key feature of NSF INCLUDES is its focus on uniting a wide variety of collaborators to generated pioneering solutions to persistent problems. Each of the pilot programs selected will create an infrastructure that enables collaboration, fueling future innovations in broadening STEM participation. The Emergency Services Program is a division of the School of Public Administration in the College of Public Affairs and Community Service (CPACS) and houses the Bachelor of Science in Emergency Management. The program also offers three undergraduate minors: Emergency Management, Fire Service Management and Tribal Management and Emergency Services and a graduate specialization in Emergency Management. A certificate in Tribal Management and Emergency Services is also available. The program is intended to provide an education that encompasses the broad array of knowledge and experience necessary to conduct emergency services and emergency administration, and to meet the demand for Emergency Management professionals at the federal, state, and local levels and in the business community.